The public preview of Azure Monitor was recently announced at Ignite. This new platform service builds on some of the existing monitoring capabilities to provide a consolidated and inbuilt monitoring experience to all Azure users. From within the Azure portal, you can use Azure Monitor to query across Activity Logs, Metrics and Diagnostic Logs. If you need the advanced monitoring and analytics tools like Application Insights, Azure Log Analytics and Operations Management Suite (OMS), the Azure Monitor blade contains quick links. You can also leverage the dashboard experience in the portal to visualize your monitoring data and share it with others in your team. These alerts can be configured to send an email and also in the case of the Metrics and Web Tests POST to a webhook. This allows for easy integration with external platforms. Atlassian JIRA is a familiar solution to many IT, software and business teams. 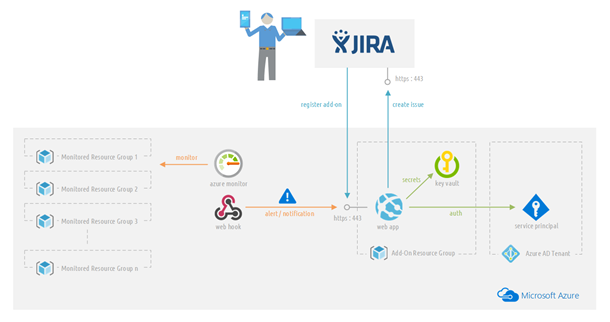 It's an ideal candidate for connecting to the Azure Monitor service via the webhook mechanism in order to create JIRA Issues from Metric and Web Test Alerts. "Azure Notifications with JIRA marries critical operational events with JIRA issues to help teams stay on top of app performance, move faster, and streamline their DevOps processes," said Bryant Lee, head of product partnerships and integrations at Atlassian. Add-ons can be built for JIRA, Confluence, HipChat and BitBucket to extend their capabilities. 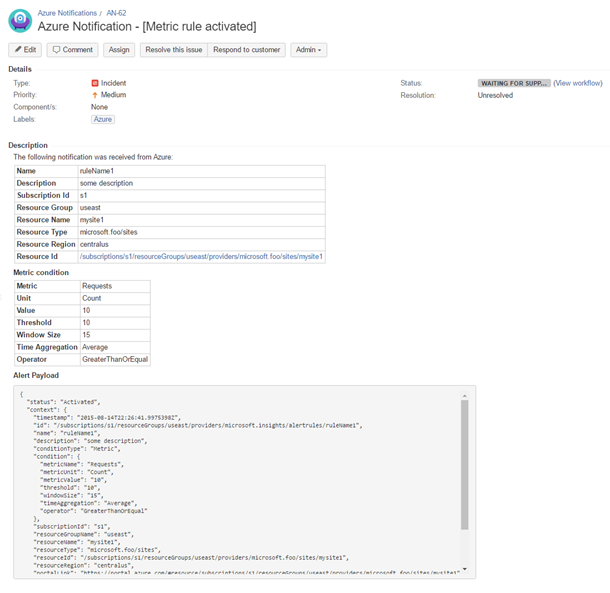 In order to make the process of deploying the add-on as easy as possible, we've built this Azure Notifications add-on to be deployed and hosted on an Azure Web App which is connected to your JIRA instance via the Manage add-ons functionality in the JIRA Administration screen. The add-on establishes a secret, key exchange and other private details with JIRA that is used to secure, sign and verify all future communication between the two. All of this security information is stored in Azure Key Vault. The add-on exposes token secured endpoints that can be configured in Azure Monitor against the webhooks exposed for various alerting mechanisms. Alerts will flow from Azure Monitor into the token secured endpoints. The add-on will then transform the payloads from the Azure Monitor alerts and securely create the appropriate Issue in JIRA. Relevant information is extracted from the Azure Monitor alerts and highlighted in the Issue. The full Azure Monitor alert payload is included for reference. The Azure Notifications for Atlassian JIRA add-on is available today in Bitbucket for you to deploy and connect your JIRA instance and Azure Monitor alerts. The overview section of the add-on's repository provides documentation on the add-on and how to install it and all its associated infrastructure in Azure. Once installed, the add-on will appear in your add-ons list in JIRA. 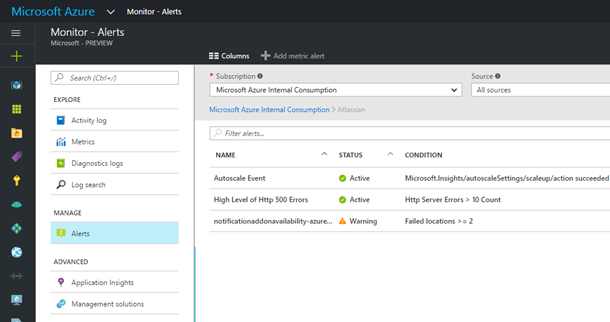 You can then configure your Azure Monitor Alerts to send alerts to the add-on. If you have resources deployed in Azure and are using JIRA, then this add-on has just made it really simple for you to start creating issues from your Azure Monitor alerts today!